MELBOURNE has made two changes ahead of its Round 2 clash with Collingwood at Victoria Park on Saturday afternoon. 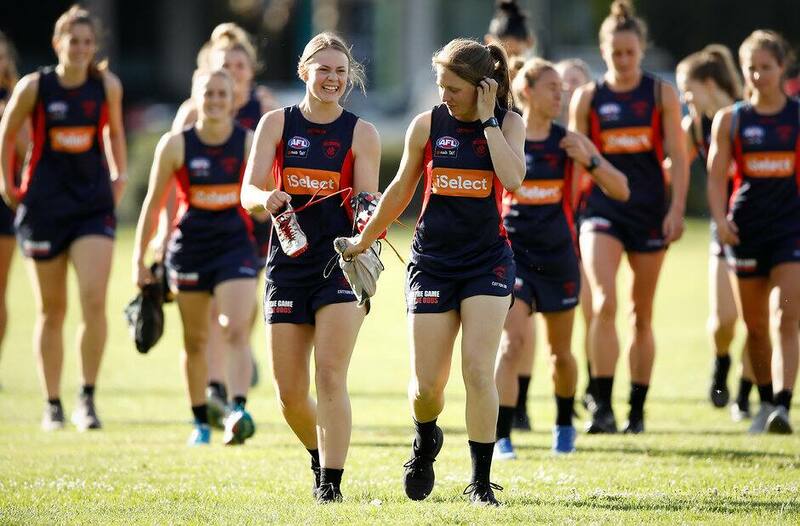 The Demons will benefit from the inclusions of hard-at-it duo Ashleigh Guest and Ainslie Kemp who have both battled injuries over the off-season. Kemp’s long-awaited return comes off the back of 12 months of rehabilitation after she ruptured her ACL during season two of the AFLW competition. And senior Coach Mick Stinear has no doubt Kemp will be at her best on Saturday. “She’s been training hard and put together a really good month of training,” Stinear told Melbourne Media. Guest has also faced some challenges on the injury front in recent times but has overcome an ankle complaint to put her hand up for Round 2. “She was really interrupted pre-Christmas with an ankle, but again, she’s another one who’s had a really good month of training and she had a really large session on Saturday,” Stinear said. Guest’s opportunity has come about after the heartbreaking news of Shae Sloane’s ACL injury against Fremantle last Sunday. While the emotion is still raw among the group, Stinear believes Sloane can continue to learn her craft from the sidelines. “She was developing into a really exciting defender for us so it’s disappointing not to have her, but we know she’ll come back bigger and better,” he said. “She’s still got plenty of education that she can do throughout the remainder of this season. “But it very much leaves a spot for us to fill. Claudia Whitfort was the other unlucky omission from the Round 1 side after making her debut against the Dockers. Melbourne played an exciting brand of footy at Casey Fields on Sunday kicking eight goals, but Stinear was disappointed to concede 59 points. “It was pleasing in terms of our attack but obviously we want to pride ourselves on our defensive game as well,” he said. “We want to beat Collingwood around the source – I thought we competed there reasonably well last week, but we were a little bit inconsistent. “So we want to be stronger around the footy, we definitely want to defend better than we did last week and then hopefully look to continue to improve on that attack. The Demons’ Round 2 clash will kick off at 4:45pm on Saturday.